The CASMACAT Workbench is a new computer-aided translation tool that implements Interactive Translation Prediction (ITP). The tool suggest automatic translations for you to post-edit. Each time you make a correction, the tool will suggest a new translation that includes such correction. This process continues until the suggested translation matches your expectations. 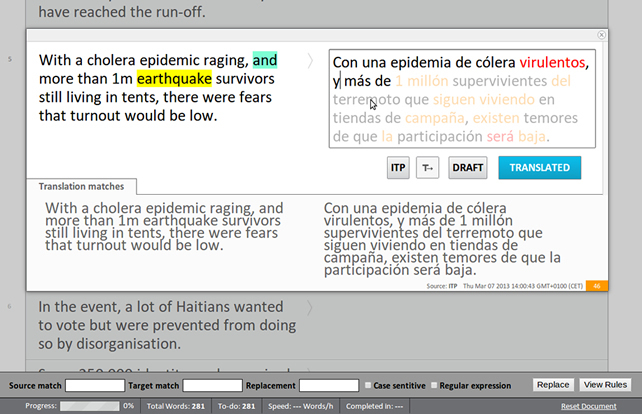 Horizontal interface; source text (left) next to the work translation text area (right). A new translation is automatically predicted after each keypress. Highlight the part of the predicted translation considered to be correct (suffix limitation). You can use the Tab key to quickly jump over this part. Ctrl+Shift+1: Toggle highlight of word alignments (mouse pointer). Ctrl+Shift+3: Toggle highlighting of target word confidence measures. Ctrl+Shift+s: Toggle suffix limitation, graying out part of the prediction. You are assumed to post-edit the predicted translations from left to right, i.e. translation errors at the beginning of the translation are to be corrected first. However, you can go back and post-edit a previous error if necessary. In this case, translation prediction is deactivated. Don't waste time deleting wrong translations. It is more productive to start editing the wrong text while the tool suggests new translation proposals to the right of you typing. Esc: Toggles translation prediction (ITP button). Enter: Saves current translation (DRAFT button). Ctrl+Enter: Validate translation, moves to next segment (TRANSLATED button). In the translation view, the document is presented in segments and the assistance features provided by CasMaCat work at the segment level. Keyboard shortcuts are available for performing routine tasks, for instance, loading the next segment or copying source text into the edit box. The user can assign different status to each segment, for instance, “translated” for finished ones or “draft” for segments that still need to be reviewed. ITP takes place every time a keystroke is detected by the system. In such event, the system produces a prediction for the rest of the sentence according to the text that the user has already entered. This prediction is placed at the right of the text cursor. The goal of confidence measures highlighting is twofold. First, it helps the user to spot wrong translations (words with very low confidence are rendered in red). Second, it can also inform the user about the dubious translations (rendered in orange). Providing the user with a new prediction whenever a key is pressed has been proved to be cognitively demanding. Therefore, the workbench displays the prediction up to the first wrong word according to the confidence measures. The rest of the words in the translation are displayed in gray. Most of computer-aided translation tools provide the user with intelligent search and replace functions for fast text revision. Of course, CasMaCat features a straightforward function to run search and replacement rules on the fly. Alignment of source and target words is an important part of the translation process. To display their correspondence, aligned words are highlighted every time the user places the mouse or the text cursor on a word.